The US Geological Survey (USGS) has released a map of earthquakes believed to be the result of human activity. Experts say most of the quakes were caused by the oil and gas industry injecting wastewater underground. Fracking was also blamed in some cases. All of the areas highlighted on the chart “are located near deep fluid injection wells or other industrial activities capable of inducing earthquakes,” the study said. Such injection-induced earthquakes are occurring at a rate higher than before, according to the USGS. Scientists said the increase in seismic activity throughout the country is mainly due to the oil and gas industry injecting wastewater deep underground, which can activate dormant faults. Many of those awakened faults have not moved in millions of years, according to Geological Survey geophysicist William Ellsworth. "They're ancient faults...we don't always know where they are,” Ellsworth said, as quoted by AP. A few cases were blamed on hydraulic fracturing, or fracking – a process in which large volumes of water, sand, and chemicals are pumped into layers of rock to free oil or gas. The increase in earthquakes has rocked once stable regions in eight states: Alabama, Arkansas, Colorado, Kansas, New Mexico, Ohio, Oklahoma, and Texas. 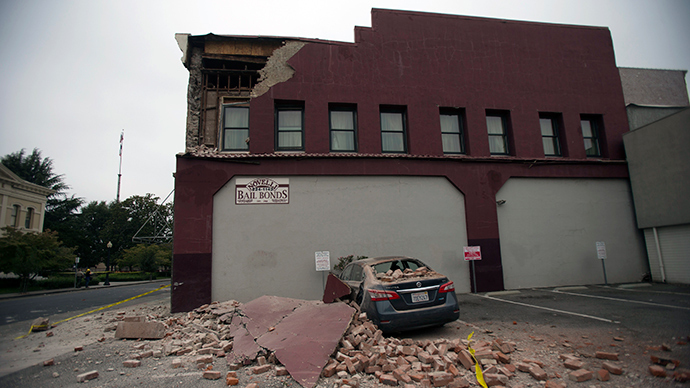 Oklahoma has been the most affected state recently, experiencing more magnitude-3 and higher earthquakes in 2014 than California – the most seismically active of the lower 48 states. The Oklahoma Geological Survey stated earlier this week that the rise in quakes in that state is “very unlikely to represent a naturally occurring process,” since they are occurring in the same area that saw a huge jump in wastewater disposal over the past several years, the LA Times reported. The state's seismicity rate in 2013 was 70 times greater than the background seismicity rate prior to 2008, Oklahoma officials said. Man-made earthquakes have been a concern for scientists for some time. This is due to the public risk factor, and the fact that even larger earthquakes could be in store. Still, the question remains about what should be done to lower the risk of such quakes occurring. USGS geophysicists Art McGarr and Andy Michael have called for better monitoring of regions with increased seismic activity. At present, some areas rely on seismic censors that can't precisely gather the location of quakes that are smaller than a magnitude-3. But that information could be immensely helpful to scientists because it would help them locate areas where seismic pressure is building up and aid them in determining the size of unmapped faults in those regions. The release comes just one day after a study announced a more direct link between fracking and earthquakes in North Texas. However, studies by the USGS “suggest that the actual hydraulic fracturing process is only occasionally the direct cause of felt earthquakes,” according to the agency's website.